Gail Hartman (Meryl Streep) is a retired white water rafter who returns to Idaho’s Salmon River to show her husband Tom (David Strathairn) and son Roarke (Joseph Mazzello) an important part of her youth – and, hopefully, to heal her increasingly fractured marriage. Gail’s hopes are shattered when a pair of fellow rafters (Kevin Bacon and John C. Reilly) refuse to leave her family alone, and ultimately take them hostage. The River Wild (1994) is a half-forgotten blend of incongrous casting and formula filmmaking. It is about as ordinary and generic an action film can get before it begins sliding into incompetence. It is deeply and as-good-as wilfully mediocre: so much so that one wonders what its generally talented cast were thinking in making it. Director Curtis Hanson has a good visual eye, but this is far from his later, better films like 8 Mile and L.A. Confidential. Hell, it’s not even as good as his earlier pulp works like The Hand That Rocks the Cradle or Bad Influence. The film is just there. It is mildly enjoyable and little else, except perhaps being remembered as Meryl Streep’s sole contribution to action cinema. It is a deeply weird film for Streep to make. Her process is based on vocal accents and mannerisms, yet The River Wild asks for none of that technique. There is nothing particularly interesting in Gail Hartman, and that means there is nothing upon which Streep may hang her famed acting technique. She simply exists: there is nothing in the screenplay to boost her, and Streep brings nothing to the role herself. Thank goodness, then, for Kevin Bacon: as an actor he has been a constant most-valuable-player in damn-near every film in which he has appeared. He is whatever his role requires him to be: buttoned-down and reserved in some performances, and wonderfully exaggerated and over-the-top in others. He is definitely in the second category in The River Wild, giving the film an excess of personality and overwhelming every other actor on screen. If there are moments where Streep – or Strathairn, for that matter – stand out, it is because they have Bacon’s hammy villain to work against. The film also features John C. Reilly is an early non-comedic role, in which he acquits himself reasonably well, as well as Jurassic Park‘s Joseph Mazello, who is in solid form. Hanson at least maintains a strong visual eye. Working with cinematographer Robert Elswit, he captures a lot of the scenic beauty of the Salmon River rapids and surrounding hills. The best shots are of the landscape, and they pop off the screen in unexpected fits and starts. Sadly with a simple story and underdeveloped characters dominating the foreground, an attractive background simply is not going to win over enough viewers on its own. 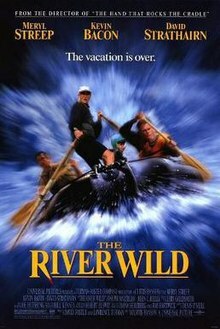 The River Wild is simply too mediocre to stand the test of time; viewers only need to sit through in once, and if you already did that back in 1994 there is no pressing need to revisit the film now.